With the Six Nations in full swing, a leading Clinical Neuropsychologist at the University of Exeter who researches links between brain injury and rugby has won an award for his work. GW4 Academic Professor Huw Williams received the British Psychological Society’s (BPS) Barbara Wilson Award – the highest UK professional award for clinical neuropsychologists. Huw Williams is an Associate Professor of Clinical Neuropsychology and Co-Director of the Centre for Clinical Neuropsychology Research (CCNR) at the University of Exeter. His recent work examined the links between traumatic brain injury (TBI) and crime, with the results influencing Parliamentary debates and government policy, in the UK and overseas. Professor Williams is also part of the GW4 Collaborative Research Working Group on Brain Injury. This community of researchers from the Universities of Bath, Bristol, Cardiff and Exeter collected pilot data to examine if a single season of exposure of rugby training and match play results in any detectable MRI or cognitive change. The community is now looking to establish large scale trends working with colleagues at EU centres. On winning the award, Professor Williams said: “It’s an honour to receive the Barbara Wilson Award in recognition for work spanning a few years! I’m fortunate to work with colleagues from Bath, Bristol, Cardiff and Exeter in multidisciplinary teams. Such team work is important when trying to understand the complexity of brain development and injury. 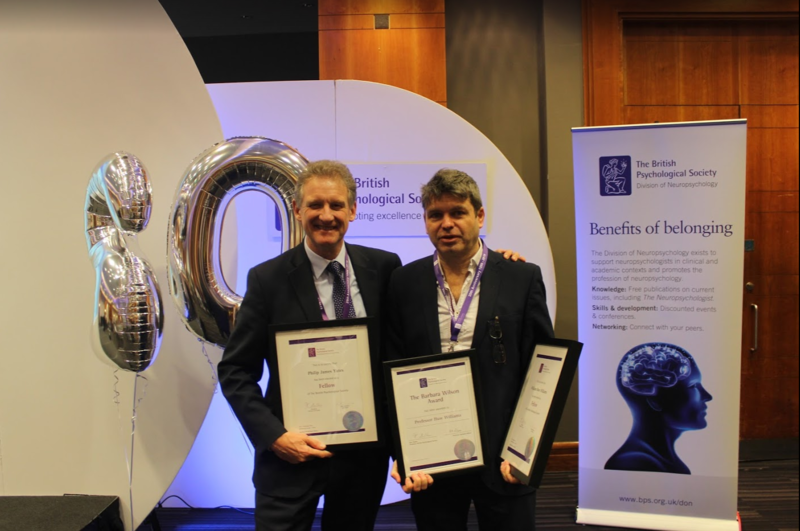 Professor Williams, along with his Exeter colleague Dr Phil Yates (both pictured above), also received a BPS Fellowship at the award ceremony in London.